Advertising on ILovetheFingerLakes.com is a cost-effective way to reach a large number of visitors both locally and from around the world. No other Web site has such an extensive listing of Finger Lakes accommodations, historical sites, and wedding facilities or provides the type of information found on ILovetheFingerLakes.com. ILovetheFingerLakes.com offers you several advertising options. Advertise where the tourists are! You can increase your exposure and appeal on ILovetheFingerLakes.com by adding photos to your listing. The cost is $25 a year per photo, setup and updates included. See providing photos (below). PhotoEmphasis covers Upstate New York and particularly the Finger Lakes Region, including Geneva, Seneca Lake, Letchworth State Park and venues such as Belhurst Castle, Inn on Canandaigua Lake and Esperanza Mansion. Please take a moment to visit our Web site. PhotoEmphasis features courteous and professional wedding photography, artistic by design--reasonably priced and non-intrusive in nature. The mini feature ad is a single photo with approximately 50 words of text. For $50 per year you can tempt visitors to click on your link, bringing them to any page on your site. 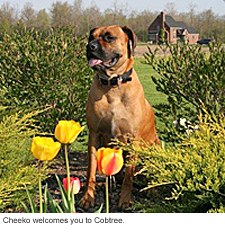 You, your family and your pets are always welcome at Cobtree Vacation Rental Homes Resort. We offer 7 amazingly affordable, individual rentals: 3 deluxe log cabins and 3 English-style brick cottages. All rentals are air conditioned and come with a fully equipped kitchen as well as free Wi-Fi, cable tv and domestic telephone service. Take advantage of nearly 2 miles of wooded trails, with more hiking, cross-country skiing and snowshoeing in the winter on our 59 acres of fields. Beach access to Seneca Lake is just 1.5 miles away. Boats, kayaks, canoes, water skis, tubes and wakeboards may be rented at a nearby marina. Strategically located in the heart of the Finger Lakes on the west ridge overlooking Seneca Lake, Cobtree offers spectacular panoramic views in a quiet rural setting just minutes from Hobart and William Smith Colleges, Seneca Lake State Park and downtown Geneva. Next to the new Lacey Magruder Vineyard & Winery and only several miles from Belhurst Castle and Geneva on the Lake, Cobtree provides easy access to the best wining and dining the Finger Lakes has to offer. Come enjoy the fun and see what the Finger Lakes has to offer at Cobtree Vacation Rental Homes Resort. The benefit of a small feature ad is that it allows for more text and more photos or a larger single photo. Each ad is $100.00 or 4 for $300.00 per year. To make yourself stand out from the crowd, you may wish to expand your listing. The medium-sized feature is ideal for this purpose. It includes a description of up to 250 words and up to 3 photos on your own page. The cost is $150.00 each per year, setup and minor updates included. See providing photos (below). Whether you want to provide yourself with a small dedicated Web page or you just want to take advantage of expanded exposure, the Large Feature may be just what you need. This dedicated Web page includes up to 750 words of text and up to 6 photos on your own page. The cost is $350.00 per year, set up and minor updates included. The cost includes text written by the publisher that is grammatically accurate and appealing to the reader. See providing photos. A banner ad is a small framed graphic in .gif format. It has a brief "mouseover" describing the graphic. Because the graphic is linked to your Web site, a click on the graphic takes the visitor directly to your site. The cost is $25.00 per year for a small banner ad similar to the one on the right (roughly 150 pixels square), which is designed to be shown in the right gutter of the page. You must provide the graphic, which is your property and can be run on other Web sites. Banner ads traditionally appear on a Web page that has some relation to your ad. The rate of the ad depends on its size of the banner, increasing by $25 for each 150 pixels in any direction. If you wish to have your banner appear on multiple pages, please contact us at publisher@ILovetheFingerLakes.com. We would be happy to discuss rates. Please note: The cost for a banner ad on the home page is $300 per year for the small size and goes up from there. This page receives the greatest number of visitors (36,373 in 2010). Feel free to inquire if you have something special in mind. Many businesses have chosen not to have their own Web sites but to establish a Web presence on other sites such as Facebook, BBOnline, etc. ILovetheFingerLakes.com would be happy to link to your page(s) on these sites. The charge for a link only is $150 per year. If done in conjunction with a paid ad on ILovetheFingerLakes.com, the cost is $50 per year. We accept only digital photos. Photos should be e-mailed to us as an attachment. If you are not able to provide photos for your ad, please contact us, and we will be happy to work with you on the matter. You will be invoiced via e-mail. Consequently, you must have a valid e-mail address to place an ad. Payment may be made by check to ILovetheFingerLakes.com at the address on the invoice or through PayPal by clicking the button on the invoice. Paypal accepts VISA, MasterCard, Discover, American Express, bank transfers, or a dedicated PayPal account. All listings and links are made at the discretion of the publisher. The publisher reserves the right to refuse to permit a listing if the publisher feels the listing is not appropriate for the Web site. All listings and links that appear on the Web site are FREE and PERMANENT. If you would like to be listed on the Web site, please contact the publisher at publisher@ILovetheFingerLakes.com.